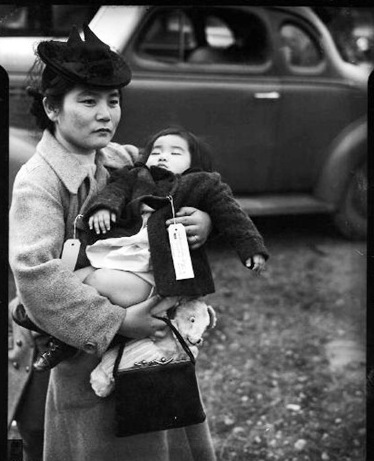 The iconic photo of Fumiko Hayashida holding her daughter Natalie at the Bainbridge Island ferry dock on March 30, 1942. Mother and daughter, 70 years later, being photographed at the Japanese American National Museum, April 2011. (OWWCC) brings together citizens and educators to bridge classroom and community fostering lessons about exclusion, inclusion, culture and identity for elementary and secondary students, through the study of WWII, Japanese American Internment, and its impact on Bainbridge Island. 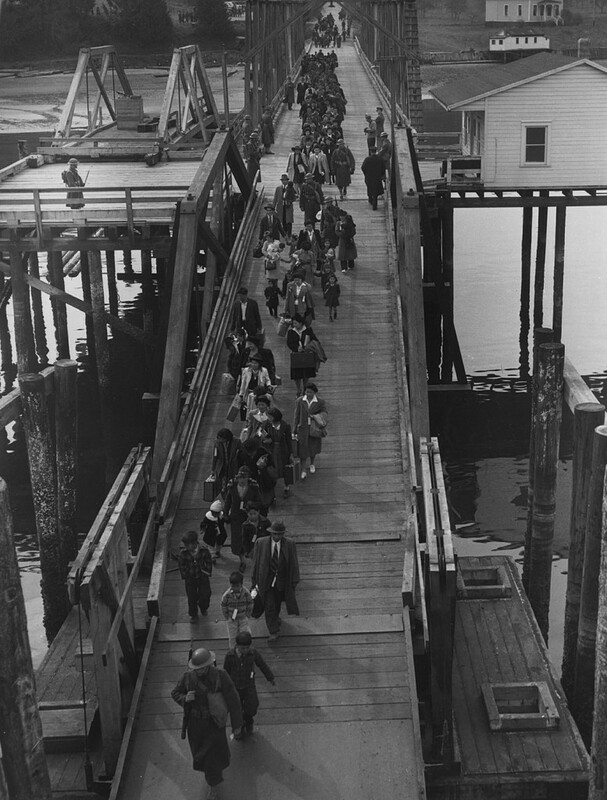 Bainbridge Island Residents of Japanese Ancestry walking down the Eagledale Dock with only what they could carry, begining their forced removal, March 30, 1942.
so we carried Strength, Dignity and Soul. Bainbridge Island educators and students are in a unique educational landscape to engage with living local and global history, particularly because of the Island’s role in the story of WWII. OWWCC is an educational and community development project founded to provide educators, students and Bainbridge citizens lived experienced that can inform a more lived curriculum. More information on student field programs with OWWCC here. 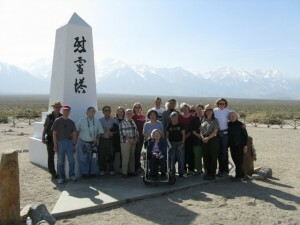 Currently this initiative is leading two major programs for adults and educators: the OWWCC Delegation to Manzanar, retracing the journey of internment by visiting Manzanar, and the professional development for educators, educating local teachers about the history and heritage of Bainbridge Island through the lives of members of descendants of our “original” community. 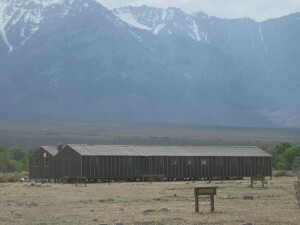 OWWCC Delegation to Manzanar Imagine having the opportunity to walk the grounds of the former Manzanar Concentration in the shoes of Japanese American residents of your community who had been incarcerated there during WWII. OWWCC has organized delegations of Bainbridge Island educators paired with current and former citizens of Bainbridge Island who lived through WWII and the experience of internment, to retrace the 1942 journey of the Bainbridge Island Japanese community to the Manzanar Concentration Camp. These journeys of discovery have charted new educational territory along the frontier of bearing witness to the Japanese American experience of exclusion, at a crucial period in its historical and contemporary legacy. 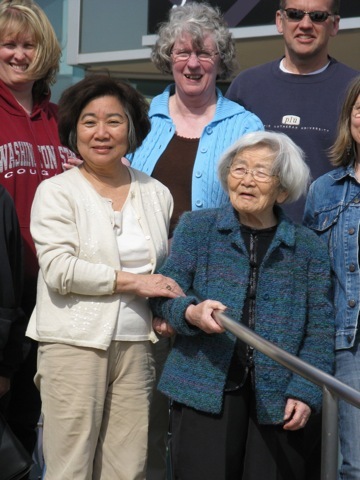 OWWCC’s offers a Summer Institute, an intensive three day program offering educators an opportunity to explore landscapes and lessons of exclusion, inclusion, citizenship and community surrounding WWII and the Japanese American Internment, through the experiences of a particular island community in the Puget Sound. Learn more about the OWWCC Summer Institute. 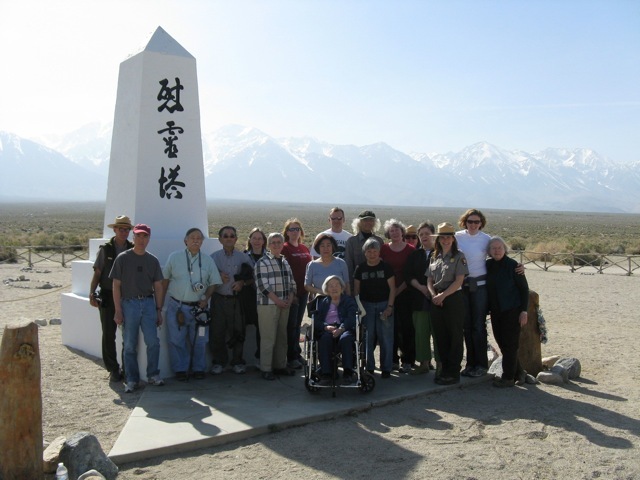 **We received a generous grant from the Bainbridge Island Arts and Humanities Council through our partnership with the Bainbridge Island Historical Museum that allowed us to to document our 3rd Annual Delegation to the Manzanar Historic Site.